Here are a few little-known books, from Tracing the Tribe’s own collection, offering much detailed information on Sephardic Jews in Girona and other towns in the province of Catalunya, Spain. Tracing the Tribe purchased some in Girona Jewish Museum bookshop, in second-hand bookshops in Barcelona and elsewhere. The Library of Congress in Washington DC may hold copies as may other libraries – I have not checked WorldCat. These provide much genealogical information in the form of archival documents and notarial records. — Documents dels Jueus de Girona 1124-1595 (Arxiu Historic de la Ciutat and Arxiu Diocesa de Girona), compiled by Gemma Escriba i Bonastre and Maria Pilar Frago i Perez. It includes an excellent 52-page surname index, a 10-page toponym (geographical) index, 14-page bibliography). The book’s text is in English, French, Catalan and Spanish – the documents are in their original language (Latin, Catalan, Spanish). The volume is marked “Colleccio Historia de Girona, 12,” published by La Caixa and the Ajuntament de Girona. Other features: A 20-page introduction to the document collection in both the historical and diocesan archives; with 250 pages of documents and record extracts. — Per a una Historia de la Girona Jueva (volumes I and II), by David Romano, (1988, Ajuntament de Girona). It has a 44-page name index, bibliography, and additional references for each chapter in the book. For each chapter, I’m including the number of articles to give readers an idea of the wealth of information. Texts are in Latin, Spanish, Catalan, French – according to the original language. — Els Jueus de Valls i la Seva Epoca, by Gabriel Secall i Guell (Edition Vallencs, 1980). This details the names of Jews of the town of Valls, and also includes some names of those who lived in nearby communities, such as D’Alcover, De L’Aleixar, D’Alforja, De L’Arboc, Cabra, Falset, Montblanc, Pla de Santa Maria, Prades, La Riba, Reus, Santa Coloma de Queralt, Sarral, La Selva, Tamarit, Tarragona, Tortosa, Vallmoll, Vilaplana, Vila-Rodona. It includes the archival references to documents with the names for all towns. 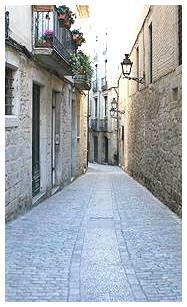 There are separate bibliographies providing additional publications for the Jews of Valls, Tarragona, Comarques Tarragonines (the smaller towns listed above), Lleida, Girona, Barcelona. There’s are general bibliographies for the Jews of Catalunya, and for the Iberian Jews. Two detailed indexes for proper names and toponyms for Portugal. It refers to a 1,500-page history by Father Antonio Carvalho Costa, which in addition to detailed geography includes detailed genealogical information on Portuguese Jewish and other families up to the year 1700. The work was published in three volumes of some 500 pages each in 1706 and 1708, but I do not see a date for the third volume. The second edition of the complete, published in 1868, is the basis of this index. Each name and geographical location provides the original volume and page for more information. The introduction is in Portuguese and English, and contains some very detailed examples of the entries. — Jews of the Caribbean, by Mordecai Arbell, provides extensive information on the history of these communities. — Sangre Judia, by Pere Bonnin, is the first book of choice for those who wish to see if their name has Jewish roots, but only the most recent edition (the 4th expanded edition) contains the surnames, year and geographical location. Documents are from pre-Inquisition, Inquisition and other sources. A previous edition is part of the large Name Search Engine at Sephardim.com, but the edition used provided no year or city. This is available online from a Barcelona bookshop, Casa Llibre. The price is 18€ or $28.26; the official title and author’s name: “Sangre Judia” (edicion Aumentada y Revisada, 2006), Pere de Bonnin Aguilo. To find it in the catalogue, use the English page (see top right of the page for other languages). Pere has also just published a second book, “Sangre Judia 2: La Brillante Estela de los Espanoles expulsados,” (2010), the price is the same. I have not yet seen the second book so cannot advise on it. Both books are in Spanish. — In 1988, the city Historic Archive (Arxiu Historic de la ciutat) in Girona discovered that multiple layers of 14th-15th century Hebrew manuscripts were used to pad covers of books and registers held in the archives. They were recycling even in medieval times, and after the Jews were expelled, the Hebrew documents were not needed. The discovery led to a still on-going process of painstaking restoration. Learn more about this here (unfortunately, it is in Catalan, but is easy to follow if you have some Spanish, French, Italian or Latin) and there is aan 11-minute video here (also in Catalan) showing the process in some detail. Additionally, there is a search engine for these Hebrew manuscript fragments. Search by title (titol), place name (desriptor toponimic), subject (ambit tematic), date (data del document), and/or name (descriptor onomastic). Now that you know about them, are you planning to work with them?